Robert Dodd was one of the principal recorders of naval actions in the American War of Independence and the French Revolutionary Wars. He engraved over a hundred of his paintings in aquatint, bringing his work to a wide audience. Dodd combined meticulous attention to the details of shipping with an ability to capture atmosphere, either in the heat of battle or, as here, in a beautiful calm scene. Dodd depicts a squadron of the Red at Spithead, the most important naval anchorage in Britain, where Nelson’s fleet was to set off for his last journey in 1803. In the right distance are the fortifications of Portsmouth. Dodd’s bright, clear palette gives great depth and airiness to the painting. The sunlit Solent is glassy and the squadron lies at anchor, waiting for a breeze. Clouds spiral into the sky and silver-grey distances evoke the moisture-laden atmosphere. At foreground left a seventy-four gun, third-rate man of war, wearing the broad pendant of a Vice-Admiral of the Red at the fore, is saluting. The decks are crowded with sailors and marines, depicted by Dodd with fluent little flicks of the brush. 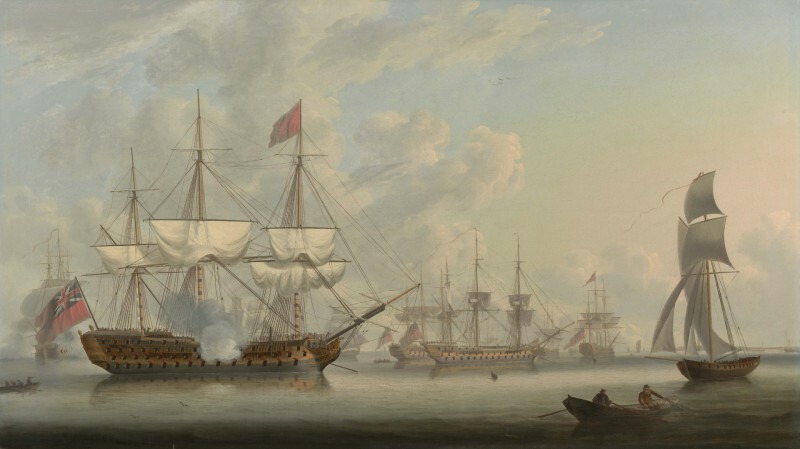 In the centre middleground are two graceful men of war seen starboard broadside on and, to the right, a first-rate, three-decker wearing a flag at the main. In the right foreground, the sails of a naval cutter make an elegant repoussoir against the pink-tinged sky; her long commissioning pendant wafts in the light air. The power and confidence of the British Navy pervades the scene and would have gladdened the hearts of viewers in those decades of war against the French. Report compiled with the help of information kindly given by John Munday. Robert Dodd was one of the principal recorders of naval actions in the American War of Independence and the French Revolutionary Wars. He did meticulous research for his battle paintings and was very accurate in his depiction of the details of ships and conditions at sea. Robert’s brother Ralph Dodd (1756?-1822) was also a painter. From about 1783 Robert engraved over a hundred of his paintings in aquatint and as a result his work gained a wide audience. Dodd exhibited at the Society of Artists in 1780, giving his address as 33 King James’s Stairs, Wapping. From 1782 to 1809 he exhibited at the Royal Academy. Dodd’s masterpiece is the large (76 x 134 in / 193 x 340 cm) painting of Lord Howe’s famous victory over the French, The end of the battle of the First of June 1794, which was painted in situ to hang in the dining room of his local inn, the Half Way House in the Commercial Road (1795; National Maritime Museum, Greenwich). His sequel to The Battle of the Saints, The shortening sail at the approach of the fatal hurricane, 1782, shows the storm which destroyed the captured Ville de Paris and the English flagship Ramillies escorting the French prizes back to England (National Maritime Museum, Greenwich). The work of Robert Dodd is represented in the United States Naval Museum, Annapolis and the National Maritime Museum, Greenwich.